Have you ever been asked to have a back translation and reconciliation done for your forward translation and you weren’t sure what that means or why it was necessary? Back translation and reconciliation services give you additional quality and accuracy assurance for your most sensitive translation and localization projects. Both back translation and reconciliation become important when you have high value content that you need translated across languages with as much certainty as possible that the exact meaning is conveyed. Back translations and reconciliations can be performed for all types of translation and localization projects. Keep reading for an overview of both back translation and reconciliation and an exploration into why these can be important. A back translation allows you to compare translations with the original text for quality and accuracy. Back translations help to evaluate equivalence of meaning between the source and target texts. 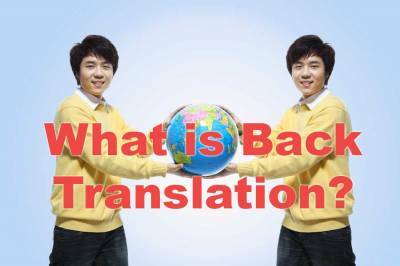 Back translation involves taking the translated version of a document or file and then having a separate independent translator (who has no knowledge of or contact with the original text) translate it back into the original language. Due to the nature of language, a back translation will never be 100% exactly the same as the original source text, but it does help to identify any confusion, ambiguities or errors that may arise from the nuances of language. Back Translations are often performed as literally as possible to give an accurate depiction of the exact meaning of the translation in the target language. Because of this, some back translations may feel artificial or unnaturally written. However, if there are major semantic differences between the source and back translation, it is not clear whether the fault is with the forward translation or with back translation. At this point, you may opt for reconciliation. During reconciliation the original source material is compared with the back translation to look for issues where the meaning is confusing or slightly off in meaning. Under reconciliation, edits and adjustments are made as needed to optimize the final translation. After performing a back translation, a report is generated that outlines all items that could be potential issues. This “Reconciliation Report” makes note of any/all differences or potential discrepancies where the meaning is confusing or slightly off in meaning. While some nuances in language may be acceptable, during reconciliation any discrepancies or differences of meaning are identified and corrected. When discrepancies are found, they are traced back to find out exactly how/where they occurred and what steps (if any) should be taken to rectify them. Project Managers may consult with and question the original translators to make adjustments to the translation. The Project Manager repeats this process for all discrepancies found within the Reconciliation Report until the source material and the back translation match for equivalence of meaning. The result is a reconciled translation that is optimized for accuracy and equivalence of meaning. A final Reconciliation Report is usually submitted to the client with the optimized reconciled translation. This report explains discrepancies (such as mistranslations, cultural differences, etc.) that were discovered in the forward translation by performing the back translation and how these were addressed. Who Typically Uses Back Translation And Reconciliation Services? Ideally anyone with high value content would want to have a back translation and reconciliation done as part of their translation process. Frequently, these services are used by pharmaceutical companies, medical device companies, clinical research organizations, and beyond for clinical trials documents, marketing materials, forms (including medical and informed consent), surveys, questionnaires, protocols, ads, assessments, reports, marketing materials and anything that contains sensitive or high risk information. Why Do Back Translation And Reconciliation? Most frequently back translation and reconciliation services are requested to satisfy a legal or regulatory requirement and/or to add additional quality checks to the forward translations. For many organizations and institutions having a back translation to verify content is a legal and regulatory requirement. In the world of clinical trials, most Institutional Review Boards (IRBs) and Ethics committees require back translations and certificates of accuracy to be submitted with all translated materials. These are done to protect patient-facing materials to ensure that any translations of such materials are of the highest caliber. Other review boards (such as for pharmaceuticals) and regulatory review processes require back translations to test and verify advertising and promotional claims. For high value information that must be completely accurate no matter what language it is translated into, or if the forward translation is complicated or has associated risk, then it should undergo back translation as part of the translation process. Back translation helps to satisfy legal and regulatory requirements. Back translation and reconciliation adds two extra quality assurance steps to the translation process. In addition to translation, editing and proofing, back translation and reconciliation adds two extra opportunities to assess and refine your translations. It is best to have these services performed on your high risk, high value multilingual projects upfront rather than take the risk that a mistranslation will not be caught. One error or even one word mistranslated can have dire consequences. A lesson can be learned from the clinical research organization that contacted us because they had relied on a competitive translator who mistranslated one word, which eventually cost them their entire research project and millions of dollars. Having back translation and reconciliation services performed upfront could have caught this error and saved them irretrievable time, funds and opportunities lost due to mistranslation. Back translation and reconciliation services give you peace of mind through additional quality and accuracy assurance and helps you avoid the consequences that come with costly translation errors. There are limits to what can be done by a language service provider that does not perform all the steps in the forward translation, back translation and reconciliation process. If you ask your language service provider to just do the back translation and they find discrepancies, it may be harder to reconcile the translations, especially if the original translators were not part of the language service provider’s team. Due to liability, most language service providers will not provide a certificate of accuracy for translations that they did not perform. It is a much smoother and faster process to have one certified language service provider perform all the steps in the forward translation, back translation and reconciliation process. When it comes to high value information where accuracy is critically important, back translation and reconciliation services help to ensure precision translations for all your target languages. When exact meaning is important, back translation and reconciliation services provide another quality check to ensure your translation says what you intend. What errors or ambiguities have you been saved from by using back translation and reconciliation? Do you think some translation or localization projects should require back translation and reconciliation? Please share your thoughts and experiences in our comments section below. If this information has been helpful for you, please like and share it socially, using the buttons above. As always, we welcome your comments in the section below.